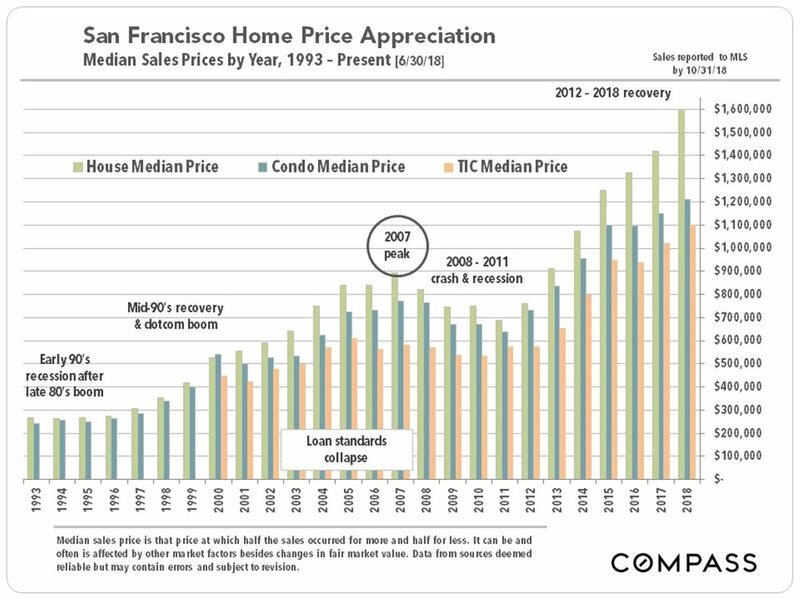 Houses selling for $3 million and above hit an all-time high - by a tad at 38 sales - in October 2018, as reported to MLS. 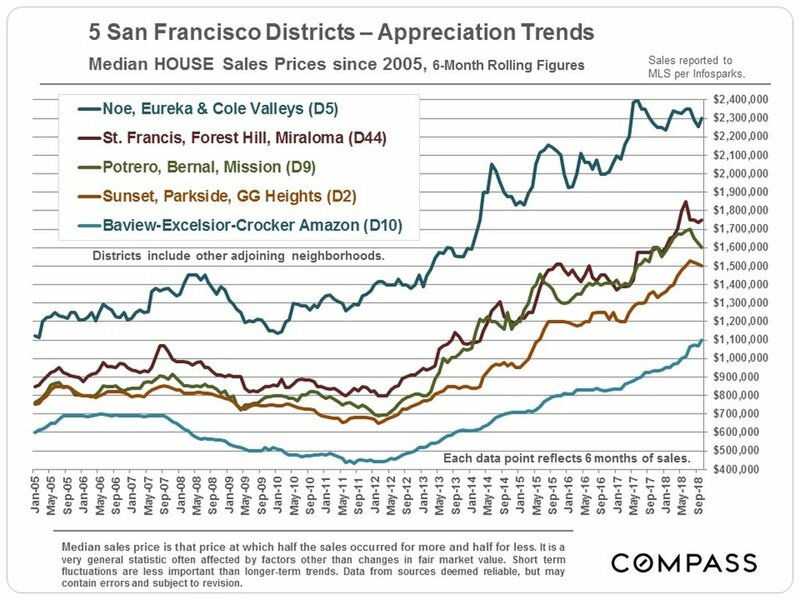 The great majority of these sales occurred in 2 districts, the Noe, Eureka and Cole Valley district, and the Pacific & Presidio Heights-Marina district - though smaller numbers of sales took place in a wide variety of other neighborhoods. 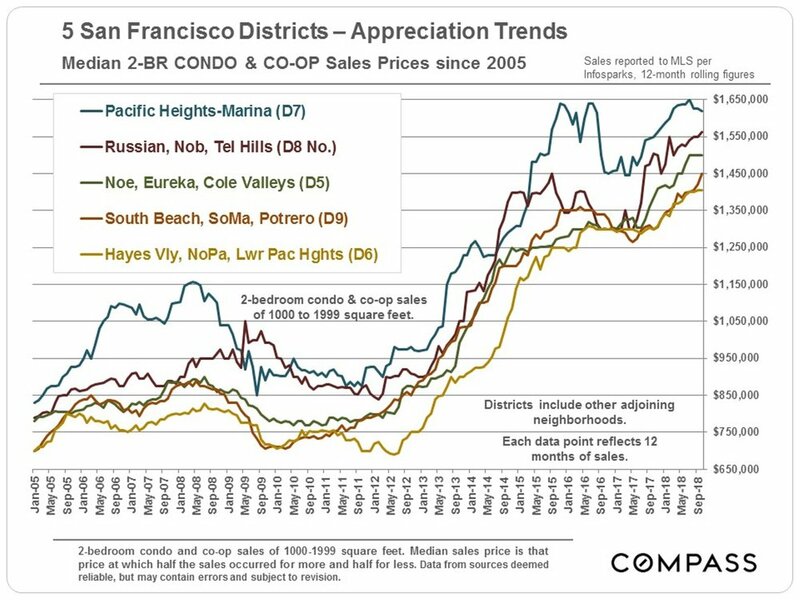 The highest-price sales were for $32 million in Pacific Heights and $16 million in Nob Hill. There were 4.5 months of inventory at the end of October, not a particularly high level of inventory for this market segment, and down 15% from October 2017. 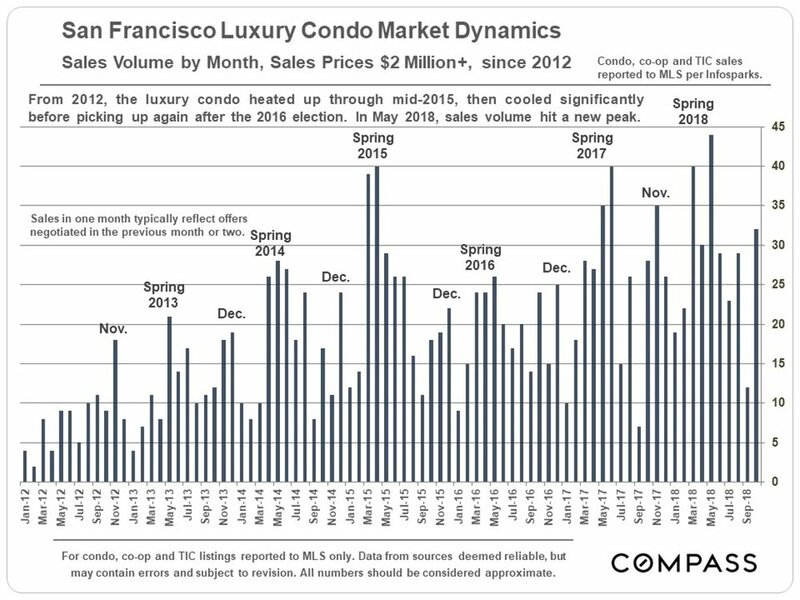 Luxury condos, co-ops and TICs selling for $2 million+ hit their highest point ever for the month of October - 32 sales - but were well below highs hit in previous spring selling seasons. The highest sale in October, as reported to MLS, was for $10.9 million - a 3200 sq.ft. unit in the St. Regis in Yerba Buena. 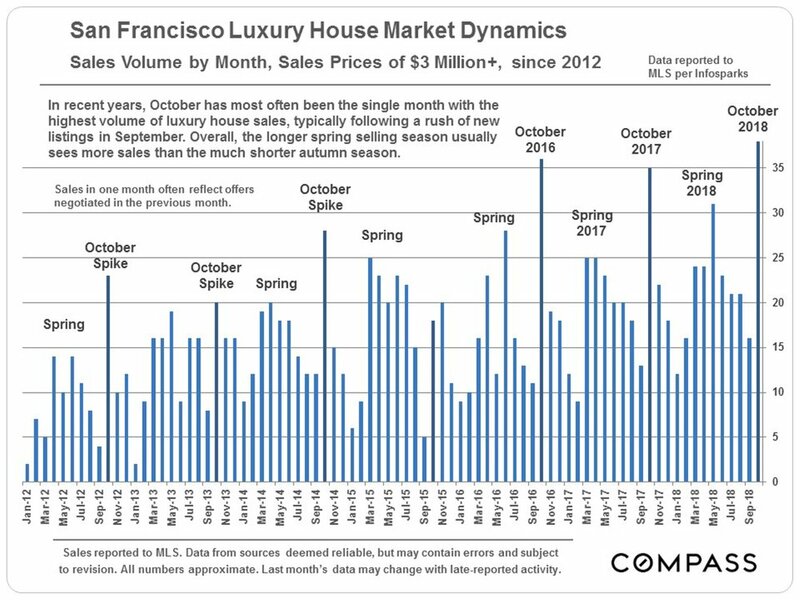 However, the number of active listings also hit an all-time high in September (144) and October (141) - 11% higher than October 2017, the previous peak (not illustrated on the sales chart below). The months supply of inventory stood at 6.5 months, which would be considered high as compared to the last 5 years - and does not include many new-project luxury condos not listed in MLS. 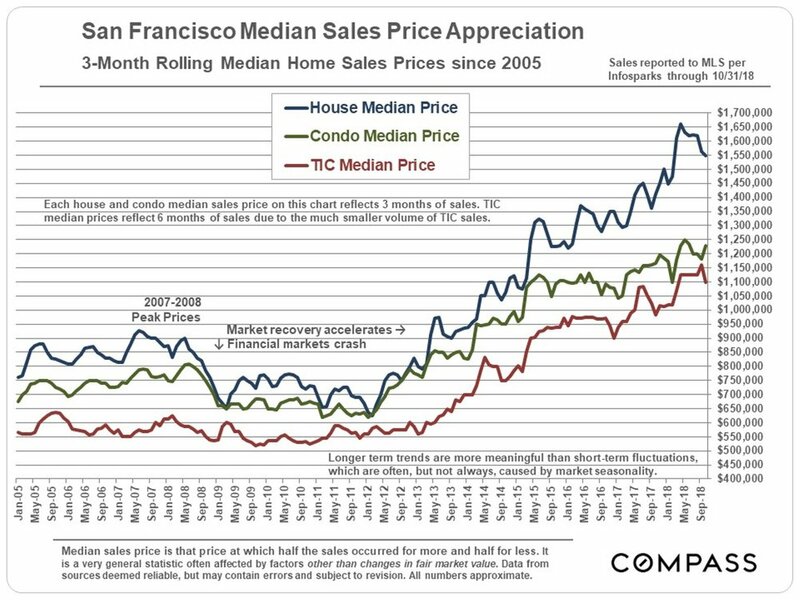 Short-term fluctuations are not particularly meaningful as pertaining to changes in fair market values - and big fluctuations are more common in more expensive areas. What are important are the longer term trends.